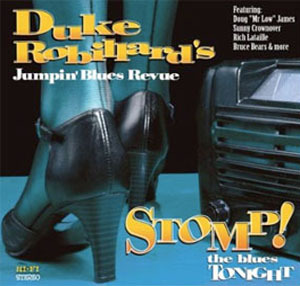 Duke Robillard's long and amazingly fruitful relationship with Stony Plain Records has produced some astonishing music - and his latest for the label adds horns and digs deep into the riotous, raunchy, rockin' '40s and '50s R&B that helped launch rock and roll. One of the most versatile and accomplished guitarists playing today, Robillard has always been fascinated by the roots of American popular music - and he's tackled everything from blues to the classic American songbook to jazz guitar duets, rock-influenced trios, small and big band swing recordings. Stomp! The Blues Tonight is certainly different from anything else Robillard has recorded for the Edmonton, Alberta-based label. Adding a strong horn section on many of the tracks - anchored by long-term colleagues Doug James on baritone and tenor, and Rich Lataille on tenor and alto - makes sure that tunes like "Stomp the Blues Tonight", "Do Me Right", "Look and Don't Touch", "Tore Up" and "Playful Baby" roar out of your speakers. A rock solid rhythm section, and Bruce Bears' inspired piano playing gives the tunes the lift they need. The 16 tracks combine songs associated with the great vocalists of that era - Wynonie Harris, Roy Milton, Big Joe Turner and more - with originals that are perfectly in the pocket. The tunes also reflect the shift when saxophone-dominated bands changed to accommodate the electric guitar as the lead instrument. The album also acknowledges the rise of the female singer in the late '40s - and vocalist Sunny Crownover certainly channels Helen Humes' classic song, "Million Dollar Secret" and "Hands Off", a tune associated with Kansas City pioneer Jay McShann. And there's also a revival of "Money's Getting Cheaper" - a song for the New Depression if ever there was one. Originally popularized by Charles Brown, it became a staple in the repertoire of Jimmy Witherspoon, with a different title, "Time's Getting Tougher than Tough." • His legendary playing skills as one of the most versatile guitarists on the planet. He's also a smooth, intimate and engaging singer. • That he's also a session player who's recorded with Bob Dylan, Maria Muldaur, Dr. John, John Hammond, and sorely-missed legends such as Jay McShann, Ruth Brown, Jimmy Witherspoon, Rosco Gordon and Long John Baldry. Oh, yes, and he's also toured with Tom Waits. • The W.C. Handy Awards have named Robillard "Best Blues Guitarist" no less than four times, B.B. King says "Duke's one of the great players;" the Houston Post called him "one of God's guitarists." Robillard had his first band in high school, and was fascinated from the beginning by the ways in which jazz, swing, and the blues were linked. In 1967, still a teenager, he formed Roomful of Blues, and the band was tight enough and tough enough to accompany two of his heroes, Big Joe Turner and Eddie "Cleanhead" Vinson on record and in live appearances. Roomful of Blues - which still continues, 40 years on - gave Duke his first exposure to a wide public, and when he left after a dozen years, he played briefly with rockabilly king Robert Gordon, then cut two albums with the Legendary Blues Band (a sterling group of former members of Muddy Waters' bands). He led his own group until 1990, then replaced Jimmie Vaughan in the Fabulous Thunderbirds, before fronting his own band once again. A glance at Duke Robillard's discography over the last 15 years since he signed with Stony Plain in 1993 would suggest that this is a man who lives in the recording studio. It's a fact that he has learned to make excellent-sounding recordings in his Rhode Island studio - and make them both fast and economically, without sacrificing a fraction of musical quality. This allows him to spend most of his time on tour - he's a veteran "road dog" who has played as many as 300 live shows a year, rivaling the legendary tour schedules of Buddy Guy and B.B. King in his younger days. Robillard travels literally from Montreal to Moscow, from Brazil to Barcelona, and from London, England to London, Ontario. Now, with this CD - his 16th for the Edmonton-based label - Robillard has demonstrated yet again the freshness of his approach to the roots of American music. This is great, honking, squawking, sax and guitar driven music. The early years of R&B saw the making of fabulous American music, and the new CD is proof you can recreate the past, twist it up a bit, make it sound as tough as it used do. Play Stomp! The Blues Tonight as loud as your speakers go. Oh, yes, and dance!